Last year, Centurian released Contra Rationem, a fast, tight record that I greatly enjoyed. On the heels of that, Hell's Headbangers is releasing some albums from their back catalog, including their original demo, Of Purest Fire, dating from 1997. 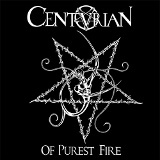 This one shows how far Centurian has come musically, but even as a demo -- now more like a long EP --, their polish is as recognizable as the blackened sound of their death metal. After the intro, Hell At Last starts so fast that it sounds sped-up. Their previous drummer, Wim Van Der Valk, was excellent, and original vocalist Seth Van de Loo, who did the vocals on Contra Rationem, delivers much the same performance, part death metal growl and part raspy shriek. Soultheft starts out with a couple of dramatically paused chords set between simply absurd amounts of picked melody, pausing for a moment of guitar solo before plunging back into the fray. A cover of Morbid Angel's Blasphemy follows, sounding rougher and more complex than the original, but when (inevitably) one compares it, it's pretty clear that the original has the edge on this one. Better off Burning and God Got Killed are of similar style, but clearer and less confusing, with the riffs following a more solid melody. The sheer speed and power on these two is phenomenal, and they're probably the racks I'd consider the best on this album. The title track has a very thrashy feel whenever the band isn't burying the listener in blast beats and their furious riffing, and comes with a solo, but the solo isn't particularly creative and sounds obligatory. The thrash part, however, is magnified in the last track, Damnation for the Holy, a cover of a song from the more thrash-oriented Inquisitor (Van Der Valk's old band before forming Centurian). This one actually has a rougher sound than the title track, and one can see where some of the inspiration behind early Centurian's disciplined approach and blasphemous subject matter came from. This demo isn't as good as some of Centurian's succeeding albums were, but as a foretaste of what was to come it does very well. It comes recommended to fans, but anyone interested in the Morbid Angel sound's successors should probably check this out too.